Using traditional methods on LMIs , an invariant set Ω(P, ρ) as the DoA has been obtained in . All trajectories of a control system are kept inside the DoA at every step . 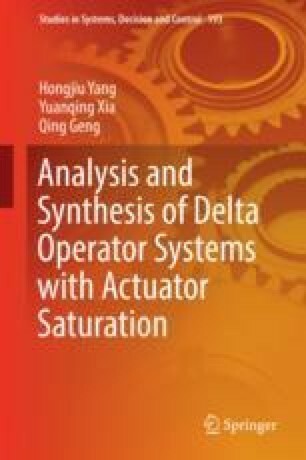 An important issue of the works in previous chapters is how to design a proper controller and how to estimate the DoA for DOSs with actuator saturation . Note that invariant ellipsoids are also used to estimate the DoA of DOSs . In , researches on the DoA have been given for uncertain polynomial continuous-time systems . Moreover, a central idea of existing methodologies on estimating the DoA is to use a contractively invariant set associated to proper Lyapunov functions , such as Lyapunov functions with ellipsoidal estimates, polyhedral Lyapunov functions , and piecewise quadratic Lyapunov functions . Although these problems have been examined extensively from various aspects recently, estimating and enlarging the DoA is still a difficult task.